The urinary system has four parts: two kidneys, two urinary tracts, one bladder and one urethra which is the final passage before the urine is excreted from the body. Urine is produced in the kidneys and they are collected in an area called “pelvis of the kidney”. Then, the urine drains from the pelvis into the urinary tract or ureter before it is accumulated in the bladder. When the pelvis of the kidney with or without the ureters are swollen, the condition is termed as HYDRONEPHROSIS. With advanced ultrasound technique, hydronephrosis can be detected in a child during the pregnancy. Antenatal Hydronephrosis when detected early allows time for proper planning of care for the child after delivery. In most cases, 90% of cases are detected after 18 weeks of gestation and 95% by 22 weeks gestation. Incidence of Antenatal Hydronephrosis is 1 in 150-700 live births, more common in cases with family history of kidney disorders from birth. It can affect only one (unilateral) or both the kidneys (bilateral). Two important causes of swelling are blockage to the urinary passage (obstruction ) or back flow of urine from the bladder as the child attempts to pass urine (reflux). Less common causes include part of a syndrome, duplication of the collecting system and even posterior urethral valve (causing bladder outflow obstruction). What to expect During Pregnancy and After Delivery? During pregnancy, the mother with an affected fetus generally does not require special care except for watchful monitoring. Pregnancy should be allowed till term and normal delivery can be allowed unless there are other problems. After delivery, the baby will be referred to the Paediatric Doctor for full examination. All babies will be examined by a Paediatric Doctor after delivery. Blood investigation may be necessary to study the kidney function of the baby. 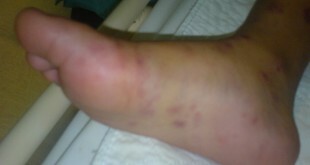 An ultrasound will be arranged after delivery to ascertain the problem. Subsequent management will then depend on the findings of the repeat ultrasound done after birth. Most of the time, the child will require a repeat ultrasound a month after the first one. Fortunately, in more than 80% of babies with antenatal hydronephrosis, they do not have an underlying serious problem and will be discharged from follow-up. 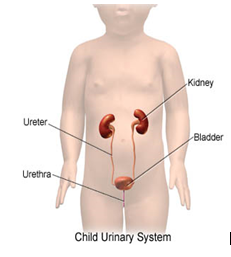 In cases with moderate or severe one-sided hydronephrosis or bilateral hydronephrosis, the child warrants a referral to the Paediatric Nephrologist or Urologist (doctors specialized in the care of children with kidney/urinary tract disease) for further work-up. The most common complication of hydronephrosis is urinary tract infection. What are the chances of having another child with similar problem? 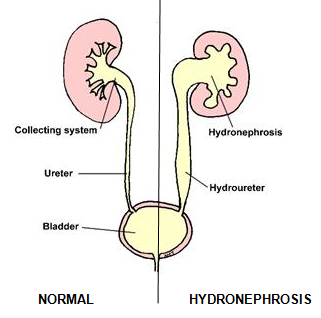 Hydronephrosis is not believed to run in families as they are not inherited genetically unless it is part of a syndrome of other abnormalities. However, it is advisable for mothers to get prenatal ultrasound during the second trimester for all future pregnancies to check the developing kidneys and bladder. Understanding Hydronephrosis, Carmen and John Thain Centre of Prenatal Pediatrics, Columia University Medical Centre.